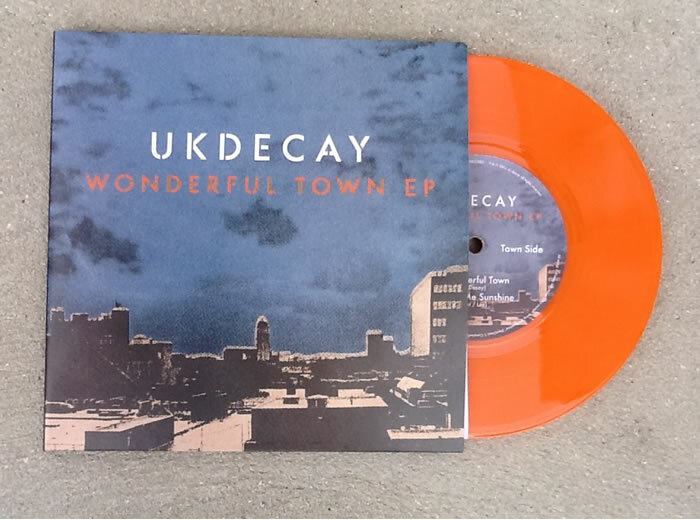 In April 2014 UK Decay released the Wonderful Town EP, paying homage to their home town and football club and raising money for two Luton based charities; Luton Food Bank and SoLYD (Supporters of Luton Youth Development). 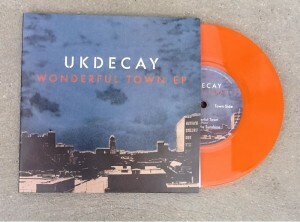 We now have some very special and limited collectors items for sale and offered exclusively to UK Decay fan groups. These include an extremely limited run of 45 hand pressed coloured vinyl EP. Each one is individual and unique with Perry from Diamond Black pouring orange onto clear vinyl and then adding small quantities of blue and orange after each press. We also have three numbered hand pulled silk screen proofs (from an edition of 10) of the front and rear sleeve artwork brilliantly done by A Thin Place. One set was recently auctioned for a £1000! Each proof is slightly different . This is truly a one-off opportunity to secure a rare piece of original punk artwork. Remember, all profits go to Lutonfood bank and SoLYD.We will update you on how much has been raised, with cheque presentations to the charities planned before a Luton home game at Kenilworth Road. Be part of the wonderful Town Story!! Che, Abbo, Spon, Ed and Ray.